Transfer the mixture to the prepared baking dish. Top with mozzarella cheese. Bake in the preheated oven 25 minutes, until bubbly and lightly browned. 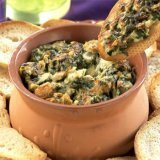 Serve with fresh vegetables, toasted pita bread, or bread sticks.